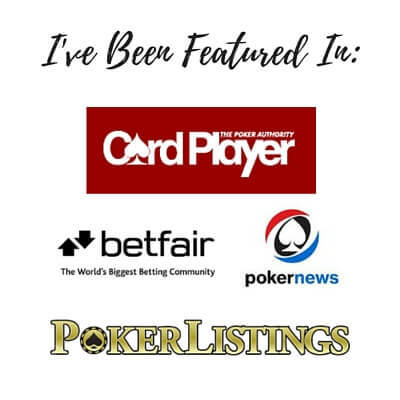 If you read this blog regularly then you will know that I am constantly preaching the importance of playing with bad poker players or fish as they are commonly known. But once you find them and get the right seat against them the game doesn't stop there. Many people make the mistake of simply waiting for a "good hand" to get involved and win a big pot. This strategy will work of course but it is by no means optimal. The best regs will instead go out of their way to get in as many pots as possible with the fish in order to make sure that they get that stack before anyone else. They do this by continually isolating the bad players with a wide variety of hands both in position and out of position. 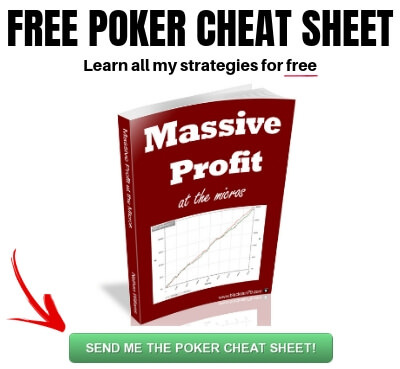 So in this article I am going to show you exactly how I go about isolating the fish at the poker tables and winning the maximum against them. 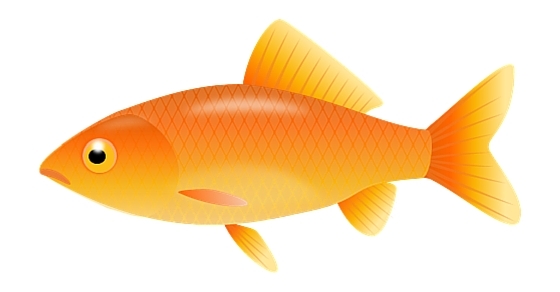 What Does it Mean to Isolate the Fish? First things first, what does it actually mean to "isolate the fish?" When you isolate somebody at the poker table it means that you target them in an effort to get the pot heads up postflop. The ideal situation is having the fish all to ourselves after the flop in order to exploit the myriad of mistakes that they are likely to make. This means that they play 53% of the hands that are dealt to them but they only raise with 6%. So the vast majority of the time that they enter the pot it is by just calling the big blind. You should frequently raise up the pot when they do this. A standard open raise is typically 3x the big blind and I recommend adding an extra big blind per limper. Hence the 4x the big blind versus one limper. But isolating the fish can also refer to 3Betting them. Once again you are raising in an attempt to isolate them and get the pot heads up. If the fish comes into the pot for a mini-raise (as they often like to do) then I would recommend making it 4x IP and 5x OOP. By increasing the size of our re-raise we force them to play a regular sized 3Bet pot if they wish to continue. What Kind of Hands Should You Isolate the Fish With? This depends on the type of game that you are playing in. One of the biggest reasons why the very lowest stakes online (NL2, NL5 and NL10) are beatable for such high winrates is because the regulars tend to be very passive. That is, they will essentially let you have your way with the fish unless they happen to have a good hand themselves. This is not the case at higher limits. The regs there think about the game on a deeper level and therefore they know how important it is to get the fish's stack quickly and they will fight you for it. But in this article I am going to assume that you play at the lower limits where you can get away with murder against the fish for the most part. What does this mean in terms of actual hands? Now it is important not to get too hung up on the actual hands listed above. I just plugged these ranges into Pokerstove (link to this free program on my resources page) and this is what it came up with. You could take some hands out and include some others. Also, it should be noted that I am talking about when the bad players limp here. I am certainly not 3Betting them with 40% or 50% of hands. It will be far, far less than this and include a lot of premium hands. The real takeaway from these two charts is just how wide I am willing to isolate the fish when they limp. I will be raising them up with anything that looks even remotely playable. Why the Difference Depending on Position? Now you might be asking yourself why I isolate with a slightly tighter range when I am out of position. The reason why is because when you have to act first after the flop it makes it much more difficult to value bet and bluff the bad players. You are always going to win far more in poker versus any type of opponent when you are in position and get to act last after the flop. So in order to compensate for my positional disadvantage I will in fact "tighten up" versus the fish when out of position. But something else I will do is increase the size of my preflop raise. So instead of making it 4x the blind as I mentioned before, I will make it 5x or 6x instead. By increasing the price that they have to pay in order to see the flop this allows me to take down a few more pots uncontested preflop. When we are OOP this is a perfectly acceptable outcome. The reason why I isolate the bad players with so many hands (and sometimes even more) is because I understand that my winrate is directly attributable to how often I am playing against them. As I have mentioned several times before, you aren't going to ever turn a big profit against the regulars. These are players who typically take the game seriously like you do. Even though this doesn't mean that they are necessarily good, they simply do not make the massive preflop and postflop errors that recreational players do. Therefore, your edge against even the very worst regs will never be close to what it is versus the fish. So I want to focus heavily on playing against the bad players but I can't sit around waiting for the nuts either because good hands only come around so often. 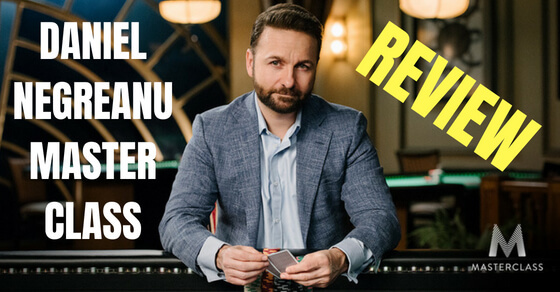 So here are 3 reasons why it is absolutely fine and recommended in fact that you play a lot of hands versus the fish. They aren't exactly waiting for the nuts themselves! So why should we? Even though we will be playing a lot of "trashy" hands (as you saw in the charts above) our opposition is playing at least as many bad hands. So therefore, we aren't putting ourselves at any sort of disadvantage. It is almost like they aren't given a fold button and a raise button like the rest of us. They just like to call, call and call some more. Therefore they often end up calling down with too many losing hands and they rarely give themselves an opportunity to win the pot by bluffing. They also have no clue about the importance of position in poker and therefore they end up fighting an uphill battle all too often. Since we don't make these mistakes we already have a massive advantage over them postflop. This is why we can easily get away with playing a few crappy hands like they do. 3. You Have to Get Involved in Order to Win! Probably the most important reason though why you need to play a lot of hands against the fish and isolate the crap out of them is because you can't win if you keep folding preflop. There is a reason why the top winners at any stake are never nits. You simply can't win big if you aren't involved in the action. The other thing (and I am going to talk about this a lot more next week) is that when you are constantly getting involved with the fish you are creating what I call a "dynamic" against them. This means that there is a playing history between the two of you. And the more that you are involved raising them up and constantly sticking a CBet in their face the more that they are going to view you as a maniac who is abusing them. There is absolutely nothing in the world that a fish cherishes more than his/her own pride. Fish literally live to make the big hero call and to show up the "bully" at the poker tables. So some of my biggest winners versus these players actually come from terrible hands like T♥5♥. And all I did was hit top pair and go bet, bet, shove. Someone looking from the outside might view me as a reckless maniac who just got lucky against a terrible player who could not find the fold button. What they didn't see is that I had been applying constant pressure for a dozen hands before this. I knew that the fish was absolutely fed up with me and therefore I could get away with massively overplaying what is normally considered a weak top pair hand. 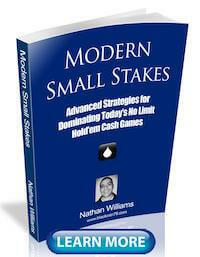 Isolating the fish on a consistent basis is an integral part of your success at the poker tables. It is not enough to just find them and get the right seat against them. In passive micro stakes games you should be going out of your way to get in pots against them by isolating them with as much as the top 50% of hands. But even when out of position you can still get away with raising the bad players up with a wide range as well. The key here is to get involved in an many pots as you can against them and utilize your superior postflop abilities. 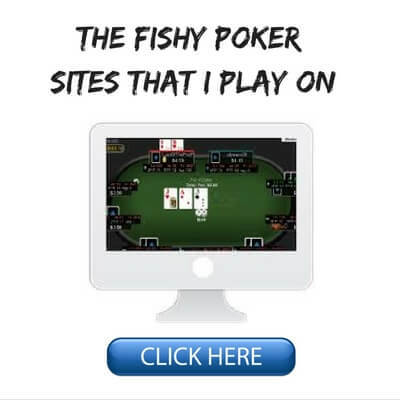 An added benefit of constantly hammering on the fish is that it tends to tilt them very easily and absolutely nothing is more profitable at the poker tables than a fish on tilt. Let me know how you go about isolating the fish in the comments below. Are there any trouble spots that you encounter when raising them up? Nice post Nathan. How does your 3-betting range approximately look like against the fish? Thanks Sasi. I don't change things much. Mostly for value with some bluffs on occasion depending on the player type. I was wondering about this as well. I would be hesitant to 3Bet a 53/6 with a very wide range considering his pfr range is so tight. Good stuff as always ! Since a while I’m trying to follow ur advise especially when IP (OOP is harder) and I start to see the results. I still have problems in the post flop because I’m not use to have such a wide range pre flop and I can’t really understand how much strong my hand is (I have a lot of week top pair, middle pair…) compared to that one of my oppo. I think a good help could be a video (I know u did some already) or article, about the post flop. I have another question, not really connected to this article but… Sometimes I sit at the table and there is a random guy starting to open or raise all in something like +30% of the time. As he is a new oppo, I have only some hands on him and I’m always wondering what a good range of call is. E.g I open 3x or 4x (NL2) with AT, he goes all in. Should I call? Sorry if the question looks stupid but I’m trying to get read of my nit/passive side and I think that in this situation I often loose massive value. IMHO the pocket pair range should be tighter, something like 99+. I would love to know what Nathan thinks. Thanks Omar. With the postflop stuff, next week's article will cover that a little bit more. 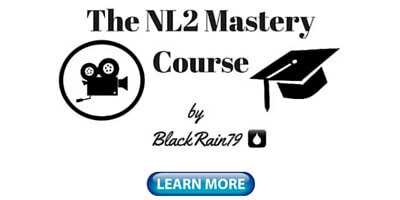 With a guy who is just shoving at NL2 it depends how often he is doing it, how much variance you can handle and what the positions are at the table. I work and poker is something I started because i like the game and of course i try to do it in the best way. this year (second one that i play the game) I'll do about 200K hands, but the number is going to encrease next one because I started to play on 5-6 table since July/August. Aniway i dont think that i can handle variance. Regarding the other things, this people go all in from every position like opening all in 100x or 3betting all in. So.. i dont think position metters so much (maybe i m wrong), but it does if we have a situation like this: 6 max: oppo 1 (fish) open 3x from HJ, oppo 2 (fish) call from CO, I 3bet 12x AQ from SB. Oppo 1 call, oppo 2 goes all in 120x. I decided for a fold because is a 3 way one of tham can have a pair an the other an Ax so may hand is not good. Consider that oppo was showing 20% of the hands. What would u do guys? Thx :). Nice article Nathan! I'll be waiting for the continuation to this article. On another topic I'm wondering, how do you keep your focus when playing long sessions? I have this issue, after the first hour of play I find myself distracted by almost everything around me. Best of lucks! Take care! Thanks Jorge! If I am losing it is very easy for me to stay focused because I want to get even. But normally this isn't an issue for me. I am engrossed in the action and I make sure that I tune everything else out, phone turned off etc. There seem to be more and more players sitting to my left countering my efforts to isoraise fish IP (CO/BU) by simply 3/4-betting (from SB/BB). In such case the fish always folds leaving me no alternative but to fold or try to elbow 'em LAGs out with 'highly potential' suited connector, Axs or broadway. I would just leave the table if you have one of these guys on your left. At the micros there are literally dozens of other tables to choose from on many sites. I think we are all fish sometimes Tee Gee haha. Some people prefer live poker. I can definitely see the allure of it and would like to play more myself. Nathan, you might kill yourself from the boredom that is live NL. Are you rolled for $5/$10? That game is worth it, though I think PLO is more $. Ya I prefer online but live is fun every once in awhile as well. I could jump into some bigger games too. I have plans to do this one day. Haha, I know where it is. Glad you enjoy my blog! I play NL2 cash games. I normally stick 4 tables at once, 6 if i'm playing really well. Is it better when starting a session, after doing proper table selection, to open one table at a time, see how it's playing and then open the next and so on? Or, open up all 4/6 tables at once and get stuck in? 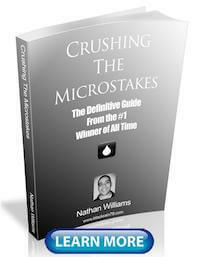 Also, what can I look forward to in your 'Crushing the Micros' book that isn't in the free newsletter and all your blog posts? I normally just open all 4 or 8 tables at once. Often I have fish tagged already so I know that they are there. If I don't then I just monitor it as I go. 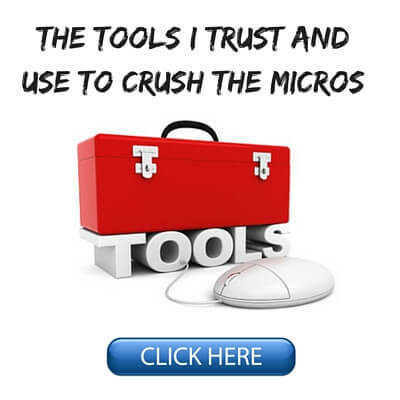 Crushing the Microstakes really just gives you everything about my strategy at the lowest stakes in an A to Z kind of approach. I have probably blogged about most of the topics in it before but the book puts everything together in an easily digestible manner. I don't understand something here .... that 50 % range from IP is from BTN and CO I assume , not MP and UTG right ? What if there are two limpers or three ? You still keep the same range ? Also your advice is changed is changed drastically so far in this post ... 40 % open raise from OOP ? You mean you open from SB with A5o or K6s ? Why ? SB/BB and BB are always loosing positions so why bother to loose even more from them ? It makes no sense to me. Hey Nathan, thanks for the great articles you always provide. What I dont get though, it seems counterintuitive to me to cbet such a wide range (after you iso) vs guys who call you down so wide. I feel like you end up blowing up the pot with marginal holdings too often. Thanks Keniff. Two points to that. It is a math thing #1. You don't need many folds to make the CBet profitable. And #2, sometimes (often) we are actually ahead with our ace high or king high. We are value betting.